Fruit are small and lopsided on this citrus greening-infected tree. University of Florida scientists think a group of hormones may eventually help growers battle citrus greening, but they still want to study them before recommending growers use the chemical. Fernando Alferez, an assistant professor of horticultural sciences at the University of Florida Institute of Food and Agricultural Sciences (UF/IFAS), leads a team of UF/IFAS researchers studying the effects of Homobrassinolides (HBr), a type of plant hormone, on greening-infected citrus trees. 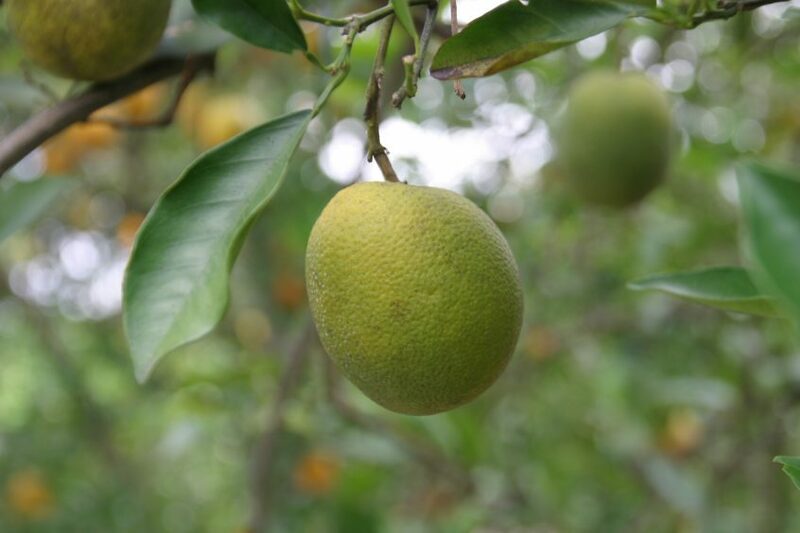 “In preliminary research, we have been able to see some positive effects of HBr on citrus tree health and fruit production,” said Alferez, a faculty member at the UF/IFAS Southwest Florida Research and Education Center (SWFREC) in Immokalee. But early research shows that with the hormone, fruit is maturing faster and is 20 percent heavier, Alferez said. The hormone also helps reduce the number of oranges that drop from the trees, he said. In treated trees, scientists have seen 15 to 20 percent more fruit per tree. “This is something growers could experiment with now,” said Michael Rogers, director of the UF/IFAS Citrus Research and Education Center (CREC) in Lake Alfred. Greening, or huanglongbing (HLB) is caused by the bacterium Candidatus Liberibacter asiaticus. So far, the hormone has not reduced bacteria in the citrus trees, Alferez said. But scientists have seen indicators of better tree health, such as more chlorophyll, in their preliminary research. That suggests that the treatment can make citrus trees more tolerant to greening, he said. Alferez and two other UF/IFAS researchers received funding from the state legislature-funded Citrus Initiative, to explore how well HBr would work on trees affected by citrus greening. Tripti Vashisth and Christopher Vincent, assistant professors of horticultural sciences at CREC in Lake Alfred, Florida, are teaming up with Alferez on the research. The UF/IFAS hormone research started during the 2017-18 growing season. Scientists set out to assess the effect of HBr on citrus tree health, fruit yield and quality. They also wanted to know if it would impact the bacterium that causes greening. They tested experimental groves at CREC and at SWFREC to ensure that results are applicable statewide. They studied the same varieties, layout and number of trees at each research center, Alferez said. If scientists can determine how to correctly time the application of the compound, their findings may help induce blooming at the desired time. The faster the fruit turns the right color, the earlier it can hit the market, he said. More information on this ongoing research will be presented Aug. 16 in the afternoon educational session at the Citrus Expo in North Fort Myers. For more information on plant growth regulators, click here.